// "der neue orient- ein regionales kulturprojekt der rheinstädte bonn-köln-düsseldorf-duisburg". A man and a woman. Two bodies colliding, pushing each other away, being drawn towards each other again. Two souls observing each other: a joining together and self-assertion, aversion and addiction to coming together. The struggle between two strong wills on the verge of destruction, possession and subjection. The theme of the production is the endless raging battle of the sexes, which is often claimed to be an extension of the culture wars. 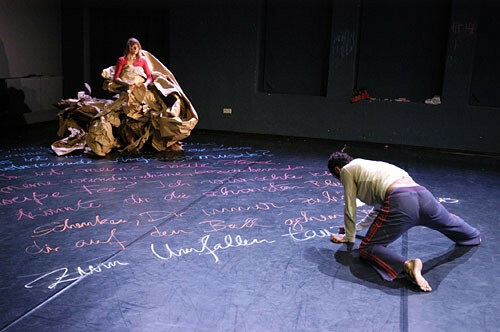 "Choreographer Rafaële Giovanola has won the International Internet Dance Festival SideBySide-net 2006. Her production, "Lovers & Strangers" has come out on top against nine other high-calibre newcomer-choreographies. As a result of an international tender, 189 artists had applied for entry in the competition SideBySide-net 2006. The expert jury of the association invited ten productions to perform during the festival opening on 29th October 2006 in Duesseldorf. Since then, approximately 30,000 viewers from Aix-la-Chapelle to Athens, have watched the short videos of the nominated choreographers on the internet and submitted their vote by virtual applause." "The production by Cocoondance Bonn was a milestone in the series "Tanz in Deutschland" at the Theater Ludwigshafen Pfalzbau. The eternal game between woman and man changes the rules of the reflection on cultural epochs. How this works, show the images of the dance performance "Lovers and other Strangers" by Swiss choreographer Rafaële Giovanola in sometimes disturbing, sometimes gentle but always attention catching images. (...) The company Cocoondance works in an area between independent and institutional dance scenes. From the one, they derive fresh and innovative ideas, from the other, the relationship to an audience without which theatrical art would end in a cul-de-sac of "bloodless drivel". "The fight between genders as pas de deux – not a very new subject for dance theatre, but rarely so funny, diverse and entertaining as in the production of Cocoondance during their guest performance of "Lovers and other Strangers" in the "Tafelhalle". Choreographer Rafaële Giovanola takes on the archaic, eternal topic with a twinkle in her eye. Viviana Escalé and Volkard Samuel Guist fight a fierce fight of love and power, full of emotions, but with numerous surprising moments." 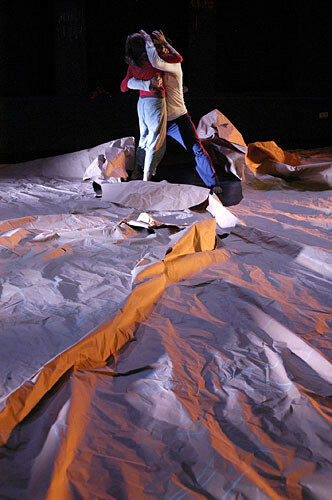 "They sprint over the stage that has been covered by a paper wave – start of a gender fight and the grandiose performance of "Lovers and other Strangers" by COCOONDANCE – within the 9th "Festival Tanztheater Schwerte". This performance impressively reveals the polarity of a relationship and provides space for indidivual fantasies. A highlight performance of dance (...) a brilliant choreography and beautiful music, composed by Jörg Ritzenhoff: dance theatre can hardly be more beautiful and more impressive." "In the dance performance "Lovers and other Strangers" by choreographer Rafaële Giovanola, they experienced a dynamic gender fight and showed – through dance – nearly all emotions up one minute, down the next. The audience in the sold-out "Rohrmeisterei" viewed this performance obviously anxiously and observed attentively the fireworks of emotional outburst. Not only the expressive dance increased the tension (...) Interlarded with symbols and metaphors, the dancers illustrate how close love and hate, tenderness and brutality are really. (...) Enthusiastic cries of "bravo" – and "encore"." Lovers and other strangers“ – this could be the title of a movie by Woody Allen. In the theatre tent of the Ruhrfestspielhaus, however, there are shown no elegant battles of words, but a theatre of bodies, stories of attraction and rejection, the desire for closeness and fear. (...) "Lovers and other strangers" is a tight, pulsating dance performance." "Whether bizarre, enchanting, poetic, outlandish or sad – the occasion to see so much experimental theatre with such a high degree of dedication and passion, so much love for the small things on stage and in the auditorium, is rare indeed. A short stroll through the first days of fringe-theatre: there was a highly sensuous game with glimpses, the power of small gestures and unspeakable emotions in the pas de deux of two lovers. "Lovers and other Strangers" is the title of a production by Cocoondance that offers unaffected, impressive images between desire and love, aversion and fear, hate and helplessness. A vocabulary of movements, full of tension, helps the two dancers to explore each other's soul on stage." "(...) My favorite for the first price is Rafaele Giovanola's oppressively intensive pas de deux "Lovers & other strangers". She creates an atmosphere of tender love, aggressive desire and seemingly dangerous hints at brutality in short, exactly timed scenes. (...) Never dragged out, always full of tension, ever new aspects – the dancers are Viviana Escale and Volkhard Samuel Guist. When they start this furious whirling of their arms, while they are taking hold of each other's right hand, the audience is frightened out of their minds that an explosion might occur. In Giovanola's production, dance and video have been connected in a convincing manner."